I love this pic of Abby! For obvious reasons! This is the girl who smiles, who loves simple things...who gets excited about handling spiders and collecting owls...a girl who is just as much at home with dragon television shows/movies as she is with My Little Ponies. Abby has a delightful innocence to her spirit, an inquisitive heart and focused mind. What been amazing to me (this is Robin, the "Papa" writing) is to hear of the steadfastness and incredible mature manner that Abby is displaying for all the hospital staff as well as our family/friends to see. I don't get a chance to see her often because I'm on "home duty" with her sisters, Lily and Anna. Even so, I hear the stories as well as see for myself when I get a quick Facetime glimpse of Abby "in battle" mode. I remember when she was three and I wrote often in her blog about the amazement and awe that we, her family, felt as we watched a young girl fight the cancer demon. 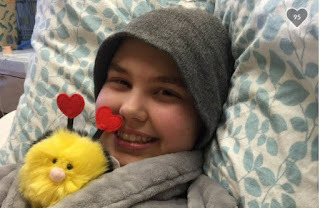 Now, the story is the same...from the stories I hear from her mom, dad and "Nana" (Vicky), Abby is focused, heroic, and proving once again that she is able to handle and work through whatever this Leukemia treatment is dishing out. For those of us who look for inspiring moments and people around us to emulate and from which to gain strength and perspective in our lives, I have no further to look than my eldest granddaughter. She has more bravery than I would have in the same situation. She rarely suffers publically...she bears all things at the same time that she joins us in believing all the promises of God for His overwhelming presence in the darkest of our despair. As I mentioned above, I'm not on the hospital front lines. Even so, I daily get an earful of information from Mark, Tiffany and Vicky. As each of them make their way to and from the hospital for their 36-hour shifts, each comes home not just exhausted but completely amazed...amazed at how this young lady is navigating trying days. I think of Abby and then I think of the shallowness of much of our culture, the people who are held up as "role models," from Pop Stars who are doted over to athletes who revel in the public's adulation. It would be interesting to get everyone in the world to take a trip through the Seventh Floor at Children's Hospital in Aurora, Colorado. THERE is the place where real heroics are being experienced day in and day out. There is the place where people should be standing up and taking notice of children of all ages facing down not critics of their superficial music or complainers of the unfairness of a sport in which millions of dollars are made...no, these children display the real heroics. They withstand the suffering that few adults I know would handle with grace and acceptance. I watch Abby and hear the stories day by day...it is the same in almost every room of the seventh floor...heroic persistence, focused hope, and enduring faith. This pic of Abby says what I can't say in words...a smile and a cuddle with another one of the seemingly millions of stuffed animals (especially owls) that adorn her room. This is the girl who is running the race and keeping the faith. We are in awe...we are in prayer...we will be the first to cheer as she crosses the finish line into health. More to come in the coming days! Beautifully said! I am praying for ALL of you every day! You have helped so many, myself included that I consider it a privilege to pray for all of you! May she recover quickly and completely! You are all so brave and amazing! May the angels watch over each and everyone of you! No star in the heavens casts a brighter glow than you, Abby, in that lovely picture. I thank God for showing us His grace through your courage.